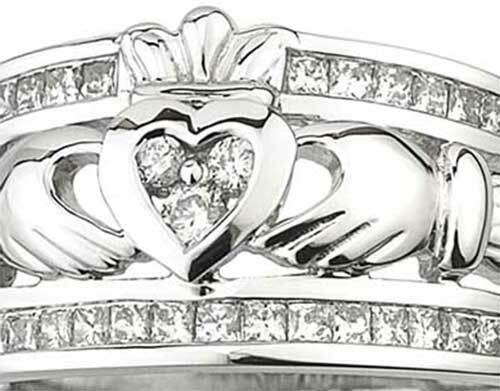 Claddagh ring features a diamond heart along with 14K white gold construction. This diamond Claddagh ring is cast in 14K white gold and it features a diamond heart along with two rows of additional stones for a total diamond weight of 0.40ct. The ring measures 1/2" wide in the front. This white gold Claddagh ring is made by Solvar Jewelry in Dublin, Ireland and it is gift boxed with a Galway Folklore card that explains how to correctly wear the Irish ring along with a Claddagh legend card, complements of The Irish Gift House. 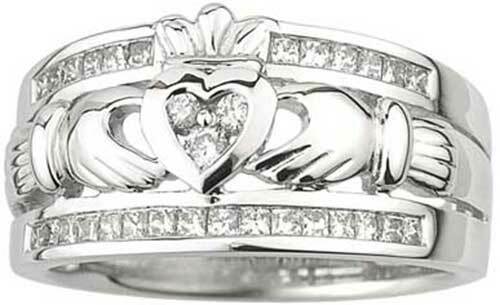 This diamond Claddagh ring is available in sizes 7 through 9, including half sizes.